Sometime this week a year ago, I traded in my full-time job for something more flexible. A stay at home, work at my pace kind of compromise. The past year has been rewarding and in some ways been reshaping my views on financial independence. The first few months were heady. I did not miss the commute or the social interaction. I turned online for my daily people fix. The telephone was my water cooler. Then a phase where I was between projects. I rediscovered my love for cinema. I searched and found movies I had missed in a decade and watched them all. I rediscovered my local library and took to reading with a vengeance. I enjoyed the break knowing it was a break. Then something happened. As I waited for word of my next project, the familiar insecurities and fears gnawed at the back of my head. Had I made the right decision? Was the trade-off for a less routine driven life worth the dollars not earned? Even as I mulled the answers, I threw myself into cooking more at home and less dinners outside. The weird tightness behind my ears when I would be stressed disappeared. I felt relaxed and enjoyed each day as if it would be the last before my next project happened. Somewhere in the midst of wondering and not knowing, I realized why I had wanted this in the first place. The joys of waking up not to the alarm but my body clock. The freedom that came from planning work around life. As I wait for the current project I am on to end, I curiously am looking forward to the break. To the days of not knowing. The weeks that seem to slow down and there is nothing to do but still myself and go with the flow. I count my blessings and realize I have the luxury of choice. One I cannot afford to take for granted. With a renewed focus, I turn my attention to a blinking screen on my work laptop. so true..enjoy the breaks and enjoy life laksh..as you rightly we have to be thankful that we have the choice there are many out there who cannot make the choice as they don;t have one !!! 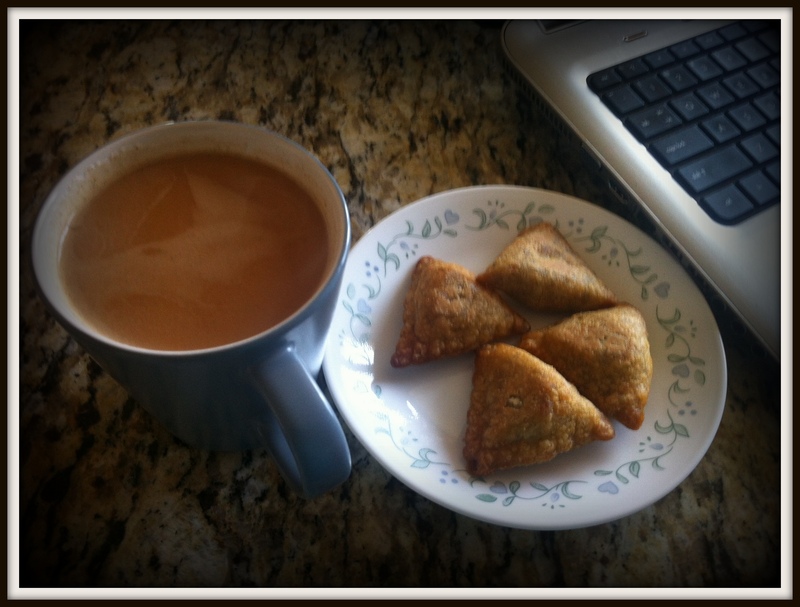 The tea and the samosas are so inviting. You make me want to post pictures with my posts. Laksh, never commented before but have always loved reading what you write. This post compelled me to write as in many ways I am where you are. Luxury of choice but sometimes worried crazy over it. May I find my true happiness and make the right choice for me like you did!